I have already written a bit on parrot harness training, here on my blog and also in Good Bird Magazine. However it is one of those behaviors that people just can’t seem to get enough of…therefore here is a little bit more! Every time I train this behavior it is yet another opportunity to refine my techniques. I am a huge proponent of training this behavior with a very strict positive reinforcement approach. Sadly there are lots of video examples of parrot harness training on the internet that claim to be positive but still clearly show the parrot does not have a choice in the matter. When you hear the trainer telling the bird “no” or “stop” or “hold still” or you hear the parrot vocalizing his objection, or even trying to escape but being blocked you can bet there is coercion being used. Harness training can be a difficult behavior to train with some parrots and I can see where one’s patience can be tested. However the pay-off of avoiding coercion is worth it. 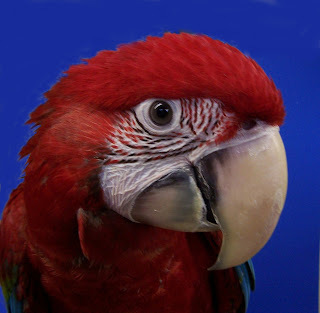 Some of you may recall Beni the Blue Throated Macaw I trained for the Kaytee Learning Center. I loved how he would just become a giant fluff ball when he saw the harness. It meant he was going to be showered with head scratches, which he loved. I am aiming for the same response with Blu Lu. Blu Lu is also a fan of head scratches. Thankfully this often makes harness training a lot easier. A parrot that is receptive to touch is far easier to teach to wear a harness than one who isn’t in my experience. Once it was clear Blu Lu liked to be touched I immediately starting pairing head scratching and cuddling sessions with the presence of the harness. I then gradually worked through approximations of putting the harness on followed by head scratches. We took our time. This is because I don’t want her to ever panic when the harness is on. This meant short sessions and small approximations. In the video clip she is up to letting me place it under both wings. She still needs some sessions to work on tightening the strap and leaving it on for longer intervals of time. Eventually the process of putting it on and taking it off will go faster than what is shown in the clip. But for now this is the pace that is working for her. My goal is that when the harness comes out, Blu Lu will be happily anticipating head scratches. That is what positive reinforcement is all about…eager participants. Enjoy the video. I will post more as she progresses on her harness training. Copyright Good Bird Inc 2010. Do you have a talking parrot? Enter him or her in the Best Talking Parrot Contest. Good Bird Inc is looking for talking parrots of all kinds to participate in an upcoming DVD. You parrot could be one of the featured stars. You also have a chance to win some fabulous prizes from KAYTEE and Good Bird Inc.
o Read the terms of the contest. By participating in the contest you agree to the terms. o Upload as many videos as you wish. o Share the link to your parrot with friends and family so they can vote for your parrot. To get you inspired here is a clip of Delbert my Yellow Naped Amazon parrot sharing some of his favorite words. I look forward to watching video clips of your special parrot! What a difference a few weeks makes. Blu Lu the Blue Throated Macaw from the conservation project the Bird Endowment has now been here about two weeks. In her first week here although quite cooperative I would describe her as hesitant. In other words the environment was so different to her that she was slow to get out and explore. Because she is a flighted parrot I really wanted her to get those wings flapping and get to know the perches in the house. She quickly learned to fly to a PVC perch that was similar to one she knew from her time at the breeders. But I had to spend some time teaching her to fly to other perches in the house. You can see this process in the video clip. Besides facilitating flight training right away, I have also been very attentive to Blu Lu’s eating and weight. When a bird transitions to a new home, that dramatic change in environment can also cause a bird to eat a bit less. This is because the bird may not be feeling comfortable and is more focused on paying attention to the new surroundings and circumstances. Blu Lu responded to pine nuts even at the breeder’s house. So I was able to weigh her as soon as we arrived at my home. She easily stepped onto a scale to get a pine nut. I then started positioning her food bowl right next to the scale when she was out in the mornings so she would simply perch there to eat. Her weight fluctuated in the 20 -30 gram range at most. And has leveled out around 600-615 grams. I also paid close attention to the quantity of food she was consuming and types. Because she is a young parrot it is especially important she is eating a healthy, plentiful and varied diet. This can help set the precedent for the rest of her life. We have also been working on meeting new people, being receptive to touch, harness training and more! I will save those for upcoming blogs. I am a big fan of the Bird Endowment for many reasons. One being that I trust their funding goes directly to helping Blue Throated Macaws. When you order products from Good Bird Inc you will notice an option to donate to parrot conservation. All the money collected has gone to The Bird Endowment. And it is that time of year to send them a check! If you would like to donate to the Bird Endowment, please consider pressing the optional donation button for parrot conservation when you make your next purchase. Thanks for supporting parrot conservation in the wild and positive reinforcement training for companion parrots! Blu Lu the Blue Throated Macaw made a new friend today. Before she arrived at my place I am not sure if Blu Lu had met any children or not. But her initial reaction to Camryn showed she was not sure kids were to her liking. When three year old Camryn first arrived at my house she had “happy feet.” She was dancing and wiggling until she found some parrot toys to play with. Blu Lu flew up to a high perch and looked down on the activity. After awhile she was willing to come over to the adults in the room to munch on some pellets and pine nuts. Pretty soon Blu Lu was willing to stay put if Camryn moved closer. Eventually Blu Lu decided her belly was full and head scratches and cuddling were in order. Camryn’s mom and I were both happy to oblige. This again paired a positive reinforcer with the presence of the little girl. Camryn joined us on the couch and brought a slew of parrot toys with her. After a while this proved to be too tempting for the much more relaxed Blu Lu. Camryn shared the toys and Blu Lu discovered kids can be fun! The process took about an hour and a half, but it is time well spent. For Blu Lu to be a great ambassador for Blue Throated Macaws it is important for her to feel comfortable around the many different people she may meet in the years to come. Today was a great start on that training. Here is a short clip of some of the interactions. Enjoy! I have a new addition to my flock of parrots. Meet Blu Lu a Blue Throated Macaw. Blu Lu was hatched at the Bird Endowment. The Bird Endowment is dedicated to Blue Throated Macaw conservation. They support conservation efforts in the field by providing nest boxes and sponsoring the work of field researchers who monitor the nest boxes and the tiny wild population that exists. Because there are so few left in the wild, another way the Bird Endowment is helping preserve Blue Throated Macaws is to maintain a genetically diverse flock of them in captivity. These birds live in large flight cages and are encouraged to behave like parrots, not pets. If for any reason the wild population should go extinct these birds may be the last hope for potentially replenishing the wild with Blue Throated Macaws. Breeding is encouraged so that this flock is robust should that day come. However sometimes parrot parents don’t do their jobs. And unfortunately Blu Lu was a bit neglected by her parents. This meant hand raising her. Because of this her inclination to be around humans would make her a less than ideal candidate for the Bird Endowment flock. I was approached to see if might like to take Blu Lu under my wing and train her to be a spokes bird for her species. I said “yes” under one condition….Wendy Craig of Wendy’s Parrots would have to finish her hand raising. That is because besides being a caring, responsible and knowledgeable breeder; Wendy knows how to train with positive reinforcement. This meant from the time she arrived at Wendy’s she was already learning how to step up, step onto scale, recall, etc voluntarily via positive reinforcement. During that phase of development parrots are sponges and it means there is an important opportunity to shape behaviors that are important for a parrot’s life in a home. Check out my article called “A Good Start to a Good Bird” in the Fall 2010 issue of Good Bird Magazine for more about this. Blu Lu has just arrived. In the blogs to follow I will update everyone on her training and progress. So far she is just adjusting to her new environment and getting to know new people. She is already great at stepping up and stepping onto a scale thanks to Wendy. Here is a video clip of the night she arrived. (Please excuse all the boxes in the background. I was temporarily storing some items at my house) It was a long day of driving and we arrived after dark. I gave Blu Lu some time to look around and get some treats from inside the travel cage before she came out. As you will see she adjusted rather quickly thanks to her previous training at Wendy’s. More videos and blogs on her progress to come. Check back soon! I love a flighted parrot. Flighted parrots challenge my training skills. When a bird is flighted he can choose to fly wherever he wants to. And if I have done my job well training with positive reinforcement usually the bird chooses to fly to me…….again and again and again. This is fabulous until I realize the parrot is launching himself at me every second he can. On the one hand my training strategy has made my bird eager to come to me. On the other I may have created a monster! If you are working with a flighted parrot and you find yourself dodging a bird who keeps flinging himself at you it’s time to put your trainers hat on and get to work! Training a parrot to recall (come to your hand) is an important behavior for flighted parrots. With a skilled, confident flyer it can usually be trained very quickly, usually within one session. However another important step in training this behavior is teaching your parrot to fly to you only when cued, not just randomly. Learn about all the features in the new Good Bird Magazine including instructional parrot training videos at the Good Bird Magazine/WingNutz Club page. I was going through some old video footage and I found a lecture I gave at Parrot Festival 2010. The lecture was on Addressing Parrot Behavior Problems. It was a particularly interesting lecture because about three quarters of the way through the power went out! It turned out the entire grid had gone down. For about fifteen minutes I fielded questions on parrot behavior in complete darkness. The room we were in had no windows. What an experience! It actually turned out to be pretty fun and I was amazed that most people stayed engaged in the Q & A and were still in attendance when the lights came back on and I was able to finish my lecture. I even got a special “The Show Must Go On Award” at the final banquet. It sits proudly on the bookshelf in my office. I thought I would share a part of that video footage with everyone. It will give you a taste of what it is like to attend a parrot training event. Here are some of the main points the lecture covered. • Parrot behavior (good and bad) happens for a reason. • Changing the environment is one good strategy to address a parrot behavior problem. • Make it irresistible to your parrot to do something else, instead of the undesired behavior. • It is important to avoid using force, coercion or aversives with your parrot. • Sometimes solving parrot behavior problems requires creative thinking. • Instead of focuses on stopping bad behavior, focus on training your parrot to do what it is you want. • 10 common parrot training mistakes. I should remind everyone that Parrot Festival is coming up again in January 2011. I will be there again as well as Robin Shewokis of the Leather Elves. Both she and I are offering a special 10% discount on online purchases made between November 21, 2010 and December 3, 2010. Orders placed in the US by December 3rd will be shipped in time for the Holidays. There is plenty of data that supports that value of having animals in our lives. As the third most popular pet, birds obviously hold a special place in many people’s hearts. However a common statement about parrots is that they are bad or challenging pets. Really? I have cohabitated with parrots for over twenty three years and really can’t think of a moment when I thought to myself “Uh oh. This was a mistake” In fact I credit my parrots for helping become the kind of pet owner all animals deserve. More importantly having a personal connection with individual parrots has helped me become aware and concerned for parrot species in the wild. As technology takes over and more people become disconnected from nature, pets may be the only animals future generations experience. By fostering a connection and giving caregivers the tools to live successfully with parrots we are doing so much more than making great pets. We are creating deep bonds that can benefit individual birds and their wild counterparts. In my experience parrots are neither inherently good companion animals nor inherently bad companion animals. The behaviors parrots choose to exhibit are the result of what earns them reinforcers or what will cause an aversive stimulus to go away. In other words parrot behavior is the result of our behavior. If we choose to reinforce behaviors we like, we will see those behaviors exhibited more often. If we try to control parrots through unpleasant experiences we are likely to create aggressive behavior or fear responses. The bottom line is parrot caregivers who are armed with tools and information on training their parrots with positive reinforcement are likely to have great success with a parrot in their home. Those who rely on coercion are sure to encounter problems and sadly miss out on the incredible relationship based on trust one can have with a parrot. The methods we choose to influence parrot behavior determine the outcome, not the genetics of the parrot. I have been fortunate to see successful parrot and caregiver relationships over and over again in my travels. Those who succeed have embraced the positive reinforcement approach to parrot behavior. Parrots are learning machines from a very young age. If you are planning on acquiring a parrot from a breeder I recommend .............read the rest of the article in our free sample of Good Bird Magazine. At a recent parrot training seminar I was fortunate to work with two amazing macaws. One was a Buffon’s macaw. These guys look very much like a military macaw but are much larger. In fact this big boy weighed about 1400 grams. That is heavier than some hyacinth macaws I have met! Willie was the name of the Buffon’s macaw. The other character was a green winged macaw named Nico. Besides being macaws, what both of these birds had in common was a strong desire to make “googly eyes” at me. Perhaps I should elaborate. One of the behaviors many macaws will demonstrate involves making eye contact, usually eye pinning a bit, facial flushing and turning their hide side to side. This is sometimes accompanied by a cute vocalization such as a kiss or “hi”. This very engaging activity is quite charismatic and often gets an equally excited reaction from parrot lovers. In many cases this reinforces the antics of the parrot. However the problem with this type of interaction is that it creates a heightened level of arousal or excitement in the parrot. And quite often this can easily flip to aggressive behavior. This excitement is not a problem if you have no intention of putting your hands or other body parts near the parrot. But if your intent is to work through a training session, this can create challenges. The first challenge is the increased risk of aggressive behavior. The second is that often the bird is so obsessed with trying to engage the trainer in a little face time that the parrot loses his focus on learning. My strategy to address this involves a few things. In many cases talking will increase the excitement. This means I become the quietest trainer I can be. I don’t even use a bridge in those moments. I just try to deliver my reinforcer super quickly. I also avoid direct eye contact with the parrot. I usually look towards the bird’s feet. I can still see the beak, etc. but I am not encouraging more cute faces when I avoid the eyes. I also will step away if the parrot does start trying throwing out too much of the highly aroused behavior. When he settles again I restart the session. 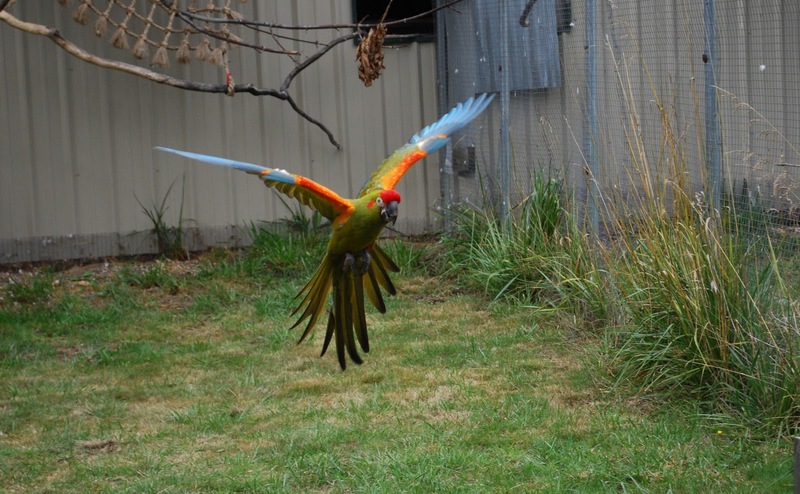 This approach worked well with Willie and Nico and I was pleased to see both macaws presenting more calm behavior during their training sessions. Willie even learned to overcome his fear of my hand and stepped up a few times. However this was quite exciting for him too so time on the hand had to be super short to avoid nipping on clothes to get a reaction. With some more training he can learn to be calm while on the hand for longer periods of time. Snowball the Dancing Cockatoo was also there. He can get pretty fired up during his dancing sessions. His caregiver Irena Schulz of Bird Lovers Only parrot rescue confirmed that waiting until he calms down after some dancing works well before asking Snowball to step up. Just like the macaws, trying to interact with him when he is super excited can lead to aggressive behavior. Getting your parrot excited, dancing and in general all fired up is not off limits. It can definitely be a great reinforcer for behaviors that are hands off and already learned, or if you are quite confident it doesnt lead to aggressive behavior for your individual parrot. Just be careful to avoid it when it is time to step up or when you want your parrot to focus on learning something new if you know your parrot is inclined to flip the switch when he gets excited. Parrot Training Mistakes…and a New Parrot Training DVD! I have just returned from Finland where I was fortunate to present a two day seminar on parrot training. This was my second time with these folks and it was just as much as fun as the first time. I wanted to share one of my moments of learning from the weekend. We had a nice big group….around 60 people. Almost every person brought a parrot too. In Finland it is common practice to keep parrots fully flighted. This has helped many parrot enthusiasts in Finland already get acquainted with training with positive reinforcement. We definitely had some great trainers in the room. However all those birds flying around at the same time could get a bit chaotic. Fortunately we were able to split the group into separate rooms for training and made some progress. One of the challenges with bringing parrots to a new location for training is that sometimes the behaviors they present so well at home fall apart in a new environment. This can be due to a number of factors such as environmental distractions or perhaps the behavior was not generalized to new locales. One such behavior for several of the parrots was going back into the travel cage. Whenever the parrots were to be left unsupervised (for example during the lunch break) we wanted the birds to be safe in their cages. While most cooperated we had a few who probably needed more practice going back into their travel cages for positive reinforcement. One such bird was Wilma, an Amazon parrot. On the first day when Wilma decided out on a perch was better than in the cage, we got a little sneaky. We basically took parts of her travel cage off so that we could lower it over her while she sat on the perch. The process was pretty uneventful and Wilma was secure. However it was not ideal since Wilma did not voluntarily climb into her travel cage. The next day I forgot to mention to Wilma’s caregiver that it might be better to work with Wilma in her less distracting hotel room until the crate training was solid. Come lunchtime Wilma was already out and about in the big room. Although what Wilma really needed was a few training sessions, the schedule was tight and we decided to try our sneaky technique from the day before. Here is where we made our mistakes. We all were hungry and anxious to go to lunch..so our patience was limited. Wilma had also learned from the day before that lowering the cage over her would mean she would be in the travel cage and not by her choice. She very quickly started choosing to move away from us. Despite this we tried a few more times……more bad choices on our part. Finally we got smart! We decided Wilma could stay out in the room and someone would remain with her to supervise. We could take turns grabbing lunch. After lunch, workshop organizer, and parrot trainer extraordinaire Milla volunteered to train Wilma to go into her cage. However because of her trust depleting experience with the cage Milla needed to find a high value reinforcer to get Wilma interested. A lovely pastry did the trick. Another great idea Milla had was to rearrange the cage so that it was easy for her to position her hands so that Wilma might enter the crate. You can see the arrangement in the photos. She also placed Wilma’s perch close to the cage so she could climb from the perch onto the cage and into it on her own. In about 20 minutes Wilma was going in the crate on her own. After so many pastry nibbles we thought she might be ready for a drink of water. We added her water cup to the cage and Wilma took the last few steps she needed in order to get a drink. Success! Wilma still needed more reps on the behavior before it would be solid, but we were happy she made it this far. Everyone felt much better about the process….especially Wilma. I must admit one of my favorite parts of the live parrot workshops is the interesting training scenarios that occur. Each bird and behavior presents different challenges. And the feedback I often hear is that the parrot training demos are extremely educational. Reading about it from a book just doesn’t present the whole picture. This leads to my mention of the new DVD. A while back we filmed one of my live parrot training workshops. It is finally available. It includes 3 discs and 4 hours of information. 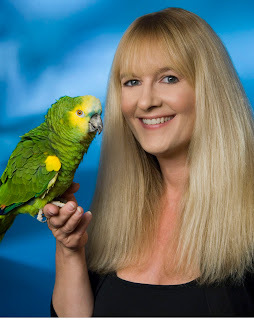 You will learn how to train your parrot, read his body language, solve parrot behavior problems and watch me demonstrate these techniques with parrots I am meeting for the first time. Most of all you will learn how to have a great relationship with your bird based on trust. I hope you will check it out and discover how these training methods can help you have a fun, well behaved and interactive companion parrot. To order the Basics of Parrot Training: A Live Workshop DVD just click this link. At the seminar in Finland we also taught parrots to drop things on cue, get comfy with a towel, allow us to bring nail clippers to their toes, get used to a harness, turn around on cue and more. I also hear there is some embarrassing video of me jumping up and down to encourage a very sweet umbrella cockatoo to put her crest up. My fingers are crossed that clip does not make it to the internet : ) In any case the workshop was great fun. I hope to meet those of you who read this blog at a parrot training workshop in the future. PS. I also learned that sitting naked with strangers in a sauna and then jumping into a lake is a typical Finnish tradition. But making eye contact with a girl or boy you like in a bar is totally embarrassing! I love the word “enriching.” Everything about it just sounds glorious. It seems to suggest being immersed in bountiful fun. Who can say “no” to that? Certainly not the animals in my household! They love enrichment and I love providing it. I can easily spend the entire morning offering fun activities for my pets and watching them revel in it. One of the great things about enrichment is that it does not have to be all that difficult to include in your parrot’s (and other pet’s) life. Enrichment can be as simple as providing a head of lettuce as seen in this clip with some sun conures at a zoo. It can also be playing some fun audio sounds for your parrot. I like to use one of those digital pictures frames to play bird sounds for my Amazon parrot Delbert. He sings along while I clean house or hop in the shower. I play this for him almost every day and simply mix up the recordings to add variety. I also love to take items destined for the trash or recycling and turn them into parrot toys. Clean empty plastic vitamin bottles, plastic caps, and empty cardboard cereal boxes can be big fun! I stuff shredded paper and treats in the boxes and string them up with untreated leather strips. Who cares if they get destroyed? They were destined for recycling anyway. Kris Porter has a site called http://www.parrotenrichment.com/ in which she shares many inexpensive ideas for parrot toys you can make at home. I also use enrichment as a way to help reinforce behaviors I want to keep strong. For example every time my yellow naped Amazon parrot Delbert is out of his cage I rotate out old toys and put in different ones. This can happen several times a day. This means every time my bird enters his cage something fun and interesting is waiting for him. This helps reinforce going back into the cage when asked. I keep a nice supply of toys on hand to make sure there is lots of variety. My dog gets in on the action too. Not only does he forage for his food, but he also chases soap bubbles, plays in the sprinkler, tears apart boxes and even loves to pop bubble wrap. I am not sure who has more fun, my animals or me! Ah yes, enrichment truly is enriching. The latest issue of Good Bird Magazine (summer 2010 Vol 6 Issue 2) is now available at this link. I also wanted to remind everyone that as of the Spring 2010 issue Good Bird Magazine is now a digital publication. We are no longer offering the print version. However the new format includes video, audio, searchability and so much more. It far exceeds what we could accomplish with print. You can take a test drive of the new features at this link. In addition by the end of 2010 the magazine will also be compatible with most popular ereaders for portability. Subscribers also get access to members only areas with additional benefits. 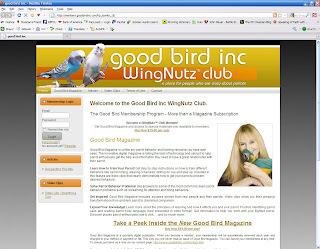 Learn more about the Good Bird Magazine Subscription and WingNutz membership here. Enjoy! (Especially the video clips! They are awesome.) Visit this link to subscribe and get access to the latest issue and a bunch of additional perks. Guess who I got to visit? Beni and Wrigley! They are the two young parrots whose training many followed here on my blog. I am happy to report they are both doing extremely well. Beni despite his initial attachment to me has happily moved onto another favorite person, John his main caregiver. However despite having a tendency to choose a preferred person he does still present behaviors for other people, including me. While I was there he did fly to me on cue. He also wowed me with his amazing flight skills. The Kaytee Learning Center is a huge open space and he has really had the chance to practice dipping, diving and circling the center. John installed perches high on the displays that allow for some spectacular flights. I can’t wait to see an audience’s reaction to Beni’s flying. I hear it is a crowd favorite. Wrigley is also doing well. The first day he saw me he came out and eagerly practiced a few flights. He then launched into some of the new words and phrases he has been learning. His little eyes were pinning with excitement as he and I jabbered away together. I like to think it means he remembers me and was happy to see me. Of course it could have been that I had a pocketful of treats. Either way it was great fun to visit with both birds. 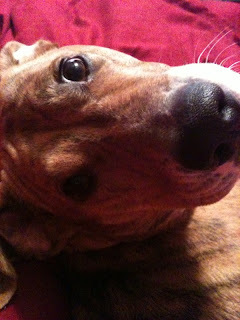 Here is a little video clip of Wrigley. He is not quite as excited this day, but at least followers of his story can see how much more yellow he now has on his head. He is growing up! I will be returning to the Kaytee Learning Center soon and will see if I can capture some clips of Beni too. Check back for further updates! 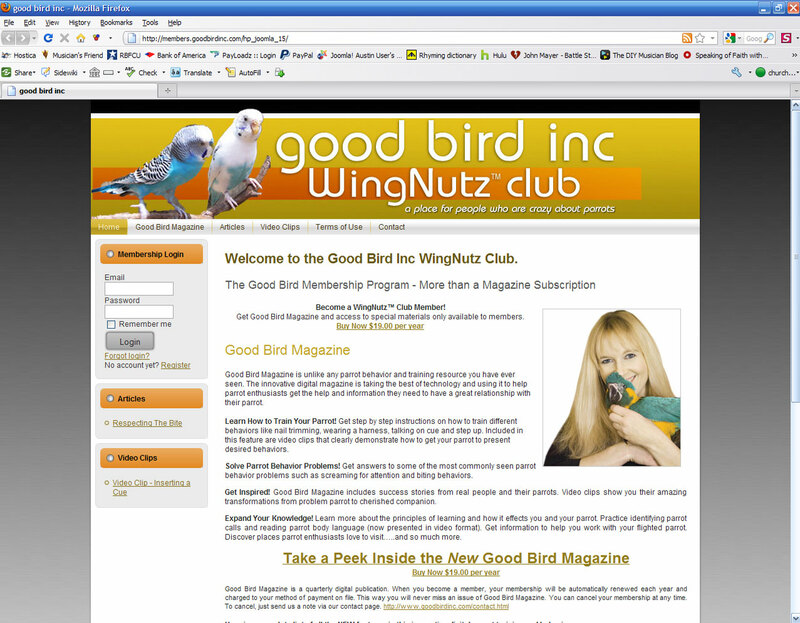 Good Bird Magazine is now a part of the NEW Good Bird WingNutz (TM) Membership Program. What does this mean for you? It means if you become a member you get access to tons of additional resources from Good Bird Inc and the newly redesigned Good Bird Magazine. You can Learn How to Train Your Parrot! Solve Parrot Behavior Problems! Get Inspired! Expand Your Knowledge! Here is a complete list of all the NEW features in this innovative digital parrot training and behavior resource. To get access to membership areas including the latest issue of Good Bird Magazine all you need to do is become a member. Click the link below to start your membership and get immediate access. Membership is only $19 per year. Next click on "register" in the Membership Login Box on the top left side of the page. Fill out the short form. Be sure to use the email address associated with your membership order. This process will confirm you have a placed your membership order. Once this step is complete you can return to the Good Bird WingNutz (TM) home page and log in using your email address and the password you chose during the registration process. After logging in you will have access to additional materials available in the WingNutz (TM) members only sections. I hope you will enjoy this great new resource designed to help you have an amazing relationship with the parrots in your life. You are never too old to learn and you are never too young. I was recently in Curacao to teach a parrot behavior and training workshop. The first day we focused on the principles of learning and the “how to’s”. The next day people brought their parrots and we did hands on training sessions. My job was to coach them through their sessions. The veterinarian who hosted the event Dr Doest had her six year old son in aattendance on the second day. His name is Connor. At one point I played a video clip on how to train a parrot to turn around on cue. This was an example the students could watch and then practice with their parrots. My focus had been on the other attendees and the birds. However out of the corner of my eye, I caught some activity going on behind my back. Connor was training a 26 year old Amazon Parrot to turn around on cue! But wait! There is more to the story. The parrot in question is named Crockey. And in the past Crockey had not always been very pleased with Connor and would show him aggressive behavior. Instead Crockey was calm and focused on figuring out what she needed to do to earn a treat. The final piece to the story that I thought was fascinating is that Connor also speaks Dutch and is just learning English. Therefore he learned mostly by watching the video clip as opposed to listening to the verbal instructions. Best of all I love that Connor was able to have fun training Crockey and build their relationship. Gotta love the power of positive reinforcement training. Way to go Connor! P.S. I have heard that since the seminar Connor has continued what he started. He and Crockey have been having more successful training sessions together. I can't wait to see what Connor will train next! I just had to share this video clip from parrot lover and friend to Good Bird Inc, Dot. Dot has attended a workshop and is a Good Bird Magazine subscriber. She really has done a fine job of applying what she has learned about parrot training to her birds. As a retired teacher I think she knows that learning never stops and I have had such fun hearing about her training successes with her birds. Here is a super important one. She taught her birds to take medications from a syringe! I love this behavior because it is easy to train and will help prevent a lot of stress down the road if your bird ever gets sick and needs medication. It breaks my heart when I hear of birds who became terrified of their owners after they were grabbed and restrained twice a day for two weeks to take medication. That experience can really damage the trusting relationship between human and parrot. That is why teaching people how to train this behavior is such a favorite of mine. It can usually be accomplished in just a few training sessions. Many times it is trained in just one session. Once it is trained it is just a matter of maintaining the behavior. This may mean offering water or juice from a syringe every few weeks or so. You can learn how to train this behavior from start to finish in the Ebook Train Your Parrot to Accept Medication. Hopefully watching Dot will inspire you to train your bird! Finding a Lost African Grey Parrot. A Success Story! Losing a parrot can be heartbreaking! And it can happen to the best of us. I was thrilled to receive this success story about Scarlett, the African grey parrot. I hope it inspires more people to be prepared for a possible parrot escape. It does not take much to have all your tools in place and it can certainly make the job of recovering your parrot a lot easier. Thank you to Keith and Christine for allowing me to share their story with you. We recently joined a bird support group near Cincinnati and as an organization we showed your video "Get Your Bird Back" to the membership, with DVDs up for sale. This occurred last Sunday and Wednesday my African grey parrot escaped out the back door. We tried to call her but she flew higher and higher and we lost sight of her. While we had not completed obtaining all the materials you suggest, we had a carrier and most importantly had already trained our two year old bird to step up to us and strangers and to fly to us. We placed the flyers, the Internet ads, newspaper classified, called zoos, vets, TV stations and police departments and then tried not to go crazy with grief. Yesterday we received a call from a woman who was on a scenic bike trail about 10 miles from our home. She had been out walking and then stopped at a local park where she was near a nature center booth. A man came off the trail and reported he saw a bird on the trail. He stopped and had the bird step up on a stick. This gathered attention and he moved the parrot away and then tried to wrap the bird in a small towel ( He knows nothing of parrot care but he was smart!) She did bite him and then flew away. This woman went to the nature center and asked about the story and then called a vet she used ( the same as mine) and the word was out! This woman called me, my breeder form Columbus Ohio called me, our organization members called....... the hunt was on. I arrived at the bike trail about an hour later and the woman who called me started walking back up the trail to find the bird, as we kept in touch, she heard another biker say they saw a group of people with the bird up the trail. I drove to that end point of the trail and the woman caller and myself closed in the gap between us but never found the crowd of people or any other reports. We posted fliers on the two ends of the trail and then my wife and I were going to walk the 4 miles of the trail from each end again to meet in the middle as it was getting near dusk. I was then called by the police department with a report that a bird had landed on a basketball goal near a man who was mulching in the town nearby. We found Scarlett inside, put her in the cage and asked for water which she took out of a bottle. She is home now and I am thanking all of those involved including you. Thank you for the video and the help. While we knew we may never have found her again, we knew that you gave us the best chances for success. We are your fans forever. Are the animals in your life your family? I know mine are. Of course I do have a human family and wonderful friends. But my animals are my constants. I can count on their joy when I return home (and many times when I just walk into the room.) If I feel like singing I know one of my parrots will absolutely join the chorus. If I decide to whistle, I am guaranteed two more parrots will participate. If I am scurrying about the house my flighted parrots will follow. If I am curled up in bed to watch some TV, my long time blue fronted Amazon parrot companion of twenty three years will insist on preening my eyelashes and eyebrows, an indescribably relaxing feeling. And of course I can always count on my dog to snuggle up next to me when I am feeling under the weather. I can’t imagine life without their company. There is plenty of information that cautions people about the responsibilities of having a parrot in the home and the potential behavior problems. And I certainly agree. Acquiring a parrot, or any animal, is something one does after researching the pros and cons and evaluating one’s own situation. I am all for responsible pet ownership. So yes, do your homework, find a responsible breeder, adopt from a reputable parrot rescue, learn about common parrot behavior problems, practice positive reinforcement, determine the financial responsibility, and keep educating yourself so that your parrot will have the best life you can offer. But after that is done and you have decided to take the plunge, be sure to take time to do this….enjoy your parrot! A parrot can change your life. I know a parrot changed mine. That eye brow preening parrot has taught me so much. I joke that my relationship with that bird is the longest of my life. But it is true. Tarah, my blue fronted Amazon parrot came to me as an adult and I know nothing about her history prior to her joining me. She was sold for $100 to a friend who worked in a pet store. When my friend could no longer care for her she came to me….with a biting and screaming problem. Even so I was enchanted when my new parrot roommate said “hello” when I was eating a piece of bread. Little did I know this small green parrot would lead me to a career in animal training. Tarah came to college with me, where I studied zoology. After graduation I went to work at a zoo. In part because of my few years as a parrot owner I secured a job at the bird show. After getting my feet wet with bird training I was hungry for more. I devoured books on training and soon found myself applying my new found knowledge on some of my parrot’s behavior problems, like that screaming for attention issue! I watched our relationship blossom as I began to understand more about how to influence parrot behavior with positive reinforcement……and Tarah learned to whistle instead of scream for attention. Even though I worked all day with animals, I looked forward to coming home and spending time with my parrot. And I thought it a good sign that my parrot seemed happy to see me too. I can’t remember the first time I was close enough that Tarah decided to preen my eyebrows, but we both obviously liked it. My parrot learned not to poop on me so she could have more time working on my eyebrows. Every time she pooped on me, I would put her back on her cage. She quickly learned to “hold it” so she could stay with me longer. My parrot taught me some important lessons on how to connect with an animal. But she also inspired me to learn more. I already enjoyed seeing animals in the wild, but soon I really wanted to see parrots in the wild. I have since had several opportunities to see parrots in their natural habitats and highly recommend it for anyone with an interest in parrots. It makes me proud that many people who share their home with a parrot are often concerned with parrot conservation. These are the folks so touched by parrots they will donate money, time and goods to make sure wild parrots can thrive. That is not something that can be said about too many other types of pet owners. Parrot lovers are a special kind indeed. At this point in my life I have met and worked with thousands of parrots. I often wonder if any of it would have happened had it not been for that one eye brow preening parrot in my life. I was once asked what my “happy place” is. Guess what my answer was. Tarah still preens my eyebrows nightly and I still look forward to it. I hope you too have a “happy place” that involves a parrot.